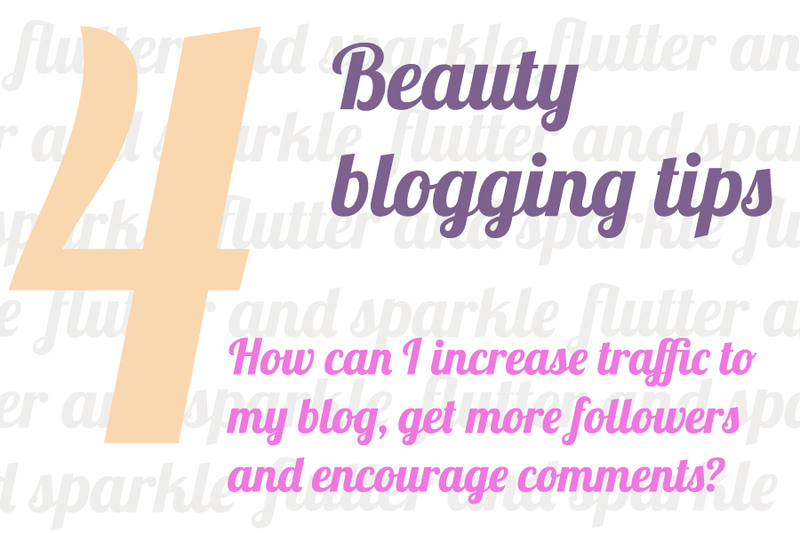 Beauty blogger tips part 4: How do I get more blog followers / traffic and comments on my posts? Did you think I'd forgotten all about this series? I wouldn't blame you if you did! I got so caught up with organising things for going on holiday and then catching up with everything when I got back. Plus this post is one of the meatiest in the series so it's taken me a while to write it. So anyway, sorry for the big gap! How do I get more blog followers / traffic and comments on my posts? Followers, comments and traffic aren't the be all and end all of everything. Blogging means something different to us all, and some people can be perfectly happy with a small readership, although the majority of people are often looking to ‘grow’ their blog. Keep in mind too that having a larger following can also bring spam, trolls and content theft, as well as various levels of invasions of your privacy. When you first start a blog, you can feel like you’re just talking to yourself and like nobody’s reading your posts. I remember being so happy when I got my first comments, it just made it all feel so much more worthwhile somehow. Getting my first followers also felt like a great achievement too. It was ages before I found out how to actually check my traffic and other stats, so I’m sharing what I know about all of these topics in this post. It sounds obvious, but if it’s not easy for someone to comment, they might very quickly change their mind and move on. Most blogs have their comment button / form right at the end of the post. This is a fairly logical place as it seems safe to assume someone would want to comment after they’ve finished reading. I’ve seen some blogs which appeared to have no comment option, but after some scrolling around I found the comment button at the top of the post, and almost missed it. If you have your comment button somewhere other than at the end of your posts, maybe play around with changing it and see how it effects the number of comments you get. This gets mentioned on the Twitter #bbloggers chat all the time, so you’ve probably heard it many times before. I’m talking about the word verification that you can have switched on for your blog’s comments. When someone has finished typing a comment, they’re asked to enter the word verification code to prove they're not a spam bot before the comment will be accepted or published. These codes are getting tougher to figure out, and a lot of people say that having to use them puts them off commenting on a blog, so you may want to think about switching this off. Blogger blogs have word verification switched on for comments as the default. If you’re worried about spam, maybe try switching word verification off and see how it goes – you can always turn it back on if you need to, or you can select the option to moderate comments before publishing (the comments are stored for your approval before they appear on the post). I don’t have word verification on. I get a lot of spam comments but these are nearly always picked up by blogger and put in the spam comments folder anyway. If a spam comment does get through, I just delete it when I spot it. If you’re wondering what I mean by spam comments, I mean ones that have no relevance to your post and are basically someone just trying to get a link to their (often dodgy) website on lots of blogs. They often says things like “Hi to all. I am eager to read this weblog's post and will recommend to family. It contains pleasant data. Check out my website...” or something random like that. I find some of the quite entertaining as they’re sometimes written in English which seems to have come straight out of a free internet translation service and they don’t make any sense. I saw one of my favourite bloggers say she didn’t like ‘open ended questions’ at the end of blog posts a little while back, so I guess it’s all down to personal preference as to whether you want to do this or not. I will put a question at the end of my posts if I think it’s relevant, or if I really do want people to comment and tell me the answer, and this seems to work well for my blog. For example, if I write a post on a nail polish brand I’ve not tried before and I really like the colour and the formulation, I might end the post with “Have you tried these – is the quality this good with other colours?” or “I really liked my first polish from this brand, which colour should I get next?”. The questions are relevant to the post and the answers might be helpful to me and other people reading the post so I think this works. In terms of sparking a debate, there is a fine line between a debate and an internet war, so be careful with your subject matter here. I’m talking about nice light debates, like “Which colour do you prefer?” or “Do you think OPI or Nails Inc have better quality nail polishes?” or “Do you think MAC makeup is worth the money?” but of course if you do decide to be a bit more controversial, you’re likely to get people talking. Keep in mind that you’ll get positive and negative comments if you spark a debate on something people feel strongly about. Once you start getting comments on your blog, make an effort to reply to them and the person who left the comment will know you valued it. In the beginning, you might want to reply to every comment – as your comments increase it might be had to keep up, and you might choose to reply to the comments that interest you or stand out. I think this is okay – it’s a personal preference thing really – I just try to keep my method consistent so that readers come to know what they can expect from me. Personally, although I might not reply to every comment, I always make sure to reply to all questions. If I know the person’s twitter name, I might tweet them the answer to make sure they get it. In the beauty blogging world, a lot of your readers might also be other bloggers. There are so many beauty blogs out there now that there’s a big community you can get involved with if you choose to. Commenting on other blogs is one way of interacting with those bloggers, and they may well click through to have a look at your blog. Some people leave their blog link when they comment on another blog. Personally, I have no issue with anyone leaving their blog link when commenting on my blog, and I’ll sometimes leave mine when I comment if I remember. I know that not everyone shares this view – sometimes I’ll see bloggers talking about how they feel it’s rude for a commenter to leave their link, but I think the majority don’t really mind too much. Those that are fussed about people leaving link in the comments are probably bloggers who get a lot of generic comments such as “Great post, check out my blog xxxxx”. These kind of comments can sometimes make the blogger feel that the person didn’t necessarily read the post or think it was great – they just wanted to leave their link. I think it's best to make your comments meaningful and don’t comment for the sake of leaving a link. A few months ago there was a new blogger who was literally spamming lots of blogs with the same generic comment just to get her link out there – it switched a lot of people off from wanting to read her blog at all, so something to think about when leaving links. Twitter is a great way of getting your blog or your blog posts noticed. Your twitter account is your own, so feel free to mention and plug your blog as and when you like. The more followers you might have, the more people will see your tweets and might come through to read your blog. Tweeting when you have a new post and giving a snippet of something which will draw people in to wanting to read that post can be a good way of encouraging readers to pop over to your blog. Twitter is also fabulous for networking and getting involved in the blogging community. I don’t tweet nearly as much as I used to, which I think is a shame as I fall out of the loop so much, but as I work during the day and can’t be constantly looking at my phone, I’ve sort of gotten out of the habit and tweet a lot less. Those that do tweet a lot and interact with other bloggers and beauty lovers can gain a large following both on their twitter and on their blog. There are also twitter hashtags and chats that you can get involved with such as #bbloggers which is a weekly chat on twitter with a different blogging related topic each time. At the end of the chat people usually exchange blog links so it can be a good way to find new blogs and open yours up to new readers. Setting up a facebook page for your blog can be a way to encourage followers. Not everyone has a google friend connect account, but most people have facebook, so having a facebook page gives your readers more options for ways to receive updates on new posts. Also through having a facebook page you can share your blog with your family and friends on your personal facebook account - if you want to! Hello Cotton and Bloglovin' are two popular sites for following blogs which will give you a reading list of new posts from your subscriptions. Being present on these sites gives your readers more options in terms of ways to follow, but new readers may find you through these sites too as they can be browsed by what's new or popular or by category etc. If you use other platforms like You Tube, Instagram, Tumblr etc etc, consider linking them up to your blog. The people who follow your updates on other social media sites might well be interested in your blog too. I'm sure I'll get some stick for saying this, as it's one of those blogging taboos if you like, but holding a giveaway will increase your followers. I think you have to be sensible. Nobody wants to be accused of buying followers, and also, you want followers who will actually read your blog and keep following after your giveaway has ended. My giveaways have grown with my blog and I think that's about right. If you've got three posts and one follower, it's not all that appropriate in my opinion to offer a giveaway for £50 worth of MAC makeup. This would be a bad idea because you'd only gain followers who want to win the prize - it's hard to tell if you're going to like a blog that only has three posts - and they'd most likely unfollow after the giveaway or never read your blog again anyway and you'd have wasted £50. You'd also get a bit of a bad reputation for having tried to buy followers. The bottom line is that people will follow a blog because of the content. Giveaways are a lovely thank you to those who support your blog and they're like a shiny advert for your blog to prospective readers, because we all like the idea of winning something nice. If you'e holding a giveaway because you'd like some new readers to become followers, make sure you make your competition easy to enter and make the rules clear. Be realistic too - if it's too difficult or time consuming to enter, or if the prize is too naff, people won't bother. You can see all of my past giveaways and how I ran them here. A blog hop is basically a big link exchange and by joining one, your link is out there in a place where new potential readers will see it and hopefully pay you a visit. In the case of a blog hop your new readers are likely to be other bloggers. Here's an example of a blog hop. I'd happily host a blog hop here on flutter and sparkle for you all to join if I knew how - I'll add figuring that out to my to-do list. There's a lot of cross over between followers and traffic, so a lot of what I've said about increasing followers applies to increasing traffic too. Your followers make up a proportion of your traffic together with the people who visit your blog but aren't 'following' by any of your methods. Your non-follower traffic is largely going to come from search engines. So for example if I write a post on the new Models Own Wonderland collection (here) when someone googles 'Models Own Wonderland collection' I expect my blog to come somewhere on the results list. There's a whole art to making sure your blog posts are found in search results. It's call SEO (search engine optimisation) and I'm no expert at the full complexities of it, but I can tell you the basic tips I follow. Post titles - don't name your post something random if you want it to come up in a search result. For example, if I name a post 'My new favourite nail polish' it's not going to come up in a search result when someone searches by the actual brand and colour name. I would suggest thinking about how you would search for your post and name it that ie 'Nails Inc Baker Street review and swatches'. Image names - did you know that search engines can see what you've named your images? If you upload an image to blogger leaving the tile your camera gave it, your missing out on a lot of traffic. If you go into google and search for a particular brand and shade of something and then click 'images' you should get images of that exact product. It's my basic understanding that the search engine comes up with the results by looking at the name of the image, so name your photos with relevant keywords and they should come up in search results. Getting a link to your blog or one of your blog posts from another blogger on their can be invaluable. You might get new visitors clicking through, but also links from other sites increases your ranking. I don't know lots about page ranking and how it works, but I know one of the factors is the number of external links to your blog. You can check your page rank here. Sometimes bloggers refer to each other's posts for reference with a link, and some like to list their favourite bloggers which is a nice way to spread the love. My favourite blogs list is here. Another way to share links is to do a 'tag' sort of post. These are like chain posts with a series of questions to answer. If someone tags you, you follow the rules of the tag answering the questions and then you tag other people. The 'tags' are blog links. I did a few of these when I was starting out and it was a good way to get chatting to other bloggers as well as to give a little bit of personal information about me to my readers. There's an example of a tag post here. Some bloggers sell advertising space on their blog. This usually consists of a small image of your choice in the other blogger's sidebar (your blog logo or a picture and some text maybe) attached to a link back to your blog. The idea is that visitors to the other blog will see the ads and click on them to visit your blog. Bloggers with the highest traffic can charge more for their ad space as they're able to attract more vistitors to your blog. An example of a blogger offering ad space to other bloggers is sprinkle of glitter. You may also see something which looks very similar to blog ads that are shared for free. Bloggers who don't sell advertising space on their blog might be willing to swap ads (also referred to as blog buttons when there's no payment involved) with each other as a way of gaining exposure to new readers. Have a look down the right hand sidebar on this blog and you'll see what I mean. I think that's about all I know about traffic, followers and comments. I hope I've not missed out anything obvious! The most obvious thing of course is to say that building a blog with the following and traffic you're after takes time. If you're serious about blogging and are patient and work hard on your blog, followers and traffic will come naturally. If you think about it, the patient approach does makes sense - if a lot of your traffic will come from search engines, the more posts you have, the more likely your blog will appear in the results. Great post...being such a new blogger I still find the whole bloggersphere so confusing, so these posts are really helpful! I am also having problems with the layout of my blog...I struggle with simple things such as getting my blog name in the centre of my blog at the top, and having links to my twitter page/options to follow via bloglovin/hellocotton onto buttons on the sidebar if that makes any sense? Could you maybe do a section on things like that? Thank you - I should have the next part ready in a week or two. That's a wonderful compliment - thank you! Not a blogger but just wanted to say that if it's difficult to comment on a blog post, I don't usually leave a comment. And as simple as it sounds - if a blogger asks a question at the end of a post, I'm more likely to comment because it makes me think about how I would answer the question. If a blogger takes the time to respond to a tweet I send or a comment I leave I am far more likely to come back again & again. It's great that you were willing to take time to compile this post to share with other bloggers. Well done! What an interesting post - and extremely useful and helpful. I found it verified a lot of my own experience in the blogging world. It does feel like you're talking to yourself at first but I think although I don't have many followers, I have enough comments to make me feel that the people who comment have become friends and have gotten to know me. Small but select is how I see it. I said to my husband it's nice to have lots of followers to make you feel popular but I've seen too many blogs with hundreds of comments saying "nice outfit" which at the end of the day doesn't say much at all. I'm a total technophobe when it comes to Twitter and Facebook but a part of me says I only have so much time in the day to catch up on everything. I started a blog because I like to witter away but also because I thought it would it would help me promote my own jewellery but I'm now at that point where I feel like I don't want to force that down people's throats and drive my readers away. But just to re-iterate - a great post and I will be reading the previous parts too. Thanks. Thank you Sue and yes I agree - I love getting comments on my posts too - it makes it all seem more worthwhile to know somebody read a post and enjoyed it! this was so helpful ! Thank you so much. I learnt a lot of things from this post. One of them being how to link my blog! As a very new blogger I find these tips invaluable. Can't wait for more! Thank you so much for taking the time to write these. Im fairly new at this and have found so much great advice and tips in your posts! What do you think on custom domains is it something to be thinking of? PS there's a little problem with your link code - I think you need to removbe the space between the < and the a at the front. great advice thanks so much. I'm a brand new blogger so trying to understand and get to grips with how everything works! This has been a great series to read! Im a brand new blogger and was really at a loss as to where to start, this has helped me a tonne. Thanks so much! wow this is sooo helpful.. i read every bit.. i have been doing this just over a year and my readers are going up all the time.. thanks alot..
these posts have been so helpful i'm really trying to establish my blog, and this has helped loads. if you, or anyone has the time to look & follow my blogs that'd be brilliant, i follow back. I love love love this post. Made me so much more driven to write my new born blog! Thank you so much for this! I have been beauty blogging for a few months, and my traffic is increasing only slowly :( Feels like I am talking to myself at the moment, but hopefully I will gain some followers soon. If you're on Blog Lovin, I'll follow you :) Thanks again. This was a really lovely informative post, I started a blog 4 months ago and I have found it hard to gain followers but I know it's a long process and this has really helped a lot! Thank you so much for all these fabulous tips! It must have taken you ages to put it all together. Was really helpful, thank you! Thank you for you tips! especially on the HTML for the url link! Thanks for the great advices! Your "comments" section really got to me. I re-checked my blog out and noticed that the the comment button is hidden; not really hidden but not very visible either. I'm going to have to change that. Anyway, I notice you mentioned using social media like tumblr. I tried out the tumblr but didn't find it efficient. Although... I may try give it one more chance. Anyway, thank you so much for your advices! I really appreciated your comments on the "comment" tip. After reading that, I changed my blog so that it would be easier for readers to leave a comment :) I never realized that the lack of visible comment button could chase away potential followers. This was so helpful thankyou for doing this series! Great tips! I'm fairly new to blogging, and find myself learning new tricks everyday. It's amazing the amount of things you need to do to promote your blog. I think I spend about 75% of blogging promoting my site, and building networks. I have only read part 4 and 5 and have already learned so much from you. Thank you so much! This is so helpful thank you! I just started blogging and your tips are probably the best for getting a beauty blog out there. I'll definitely bookmark the page! This was very, very helpful. I'm a new beauty blogger and I appreciate every sign of support! All your parts were very helpful love. Thank you so much for this post! I'm going to check out all your other parts next :) I am pretty new to blogging and this was very helpful, honest advice which I really appreciate! This post was very helpful. I just started blogging this month... It's so hard to self promote. But I'm hoping with your advice I can get more people to read my blog. Thank you. Thanks for the ideas! You do all of these really well. This is a great community you’re fostering! for more information about Beauty tips and tricks. I've just started a new cruelty-free beauty blog and was surprised to see just how much support the beauty blogging community has for new beginners.